Perhaps they have never needed a gun in a moment’s notice for self-defense. Perhaps they have never heard the story of Carole Brown. You can help ensure there aren’t more victims like Carole by helping push Constitutional Carry in Wisconsin — more on that in a minute. Carole Brown was a woman living in fear. Each day she was afraid that her ex-boyfriend was going to come and attack her as he had promised to do many times. Carole did what most gun grabbers would want her to do. She installed security cameras around her home. She obtained a restraining order, a piece of paper, that told her ex that he couldn’t come anywhere near her. But deep down Carole knew that a piece of paper wouldn’t be enough to stop her deranged and hate-filled ex from trying to see her and harm her. That’s when Carole decided she needed something much stronger to be able to stop him — a firearm. Carole understood that police couldn’t be everywhere at once. She understood that in order to get the protection she needed, she had to get a firearm for self-defense. Unfortunately, Carole lived in New Jersey. New Jersey has some of the strictest gun control laws in the country. The law requires people to get a permit to own a gun and another permit to carry the gun. Both are time consuming, unconstitutional infringements on the right to keep and bear arms. But for Carole, she knew that her ex was going to come after her, so she filed the necessary paperwork to obtain a firearm for self-defense. She waited for her permit to buy a handgun. The permit is supposed to be reviewed within 30 days. For Carole, it had been nearly two months since her application was filed. She followed up with the police department several times to inquire about the permit. They told her they were working on it. Unfortunately, their long delay cost Carole her life. Finally, one evening her ex found her in the driveway as she was exiting the vehicle after a long day at work. He viciously attacked her, stabbing her multiple times in the driveway. Her body lay helplessly on the ground in a pool of blood and she died from her wounds. The piece of paper didn’t stop her ex. The surveillance cameras didn’t stop her ex. And unfortunately, the law didn’t either. You see, these are the stories the gun grabbers don’t want you to know about. They maintain this delusion that criminals are going to follow the law. Clearly, Carole Brown’s ex was not deterred by the restraining order, or the fact that there was already a law against murder. He was determined to carry out his act, and the state of New Jersey was determined to keep her defenseless. Even if Carole had managed to get a permit to buy a handgun in time, she would have needed yet another permit to carry it. That’s why Constitutional Carry is so important. It removes the time barrier potential victims need to defend themselves and their families from attackers. You see, right here in Wisconsin you are forced to jump through government red tape before you can carry your handgun for self-defense. You must obtain permission from the government to exercise your Constitutional right! YOUR safety and the safety of YOUR family is YOUR responsibility. We can’t rely on others to do that for us. And that’s why Constitutional Carry is so important. It restores the right of law-abiding citizens to protect themselves at a moment’s notice, without having to put their name in a government database. It is working well in the 13 states that currently have it, and it will work well here in Wisconsin. And that’s why the legislators in Madison need to know that you support Constitutional Carry! 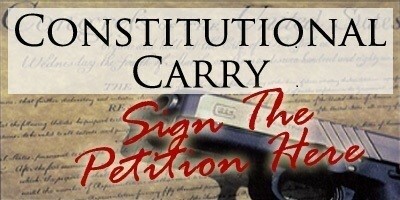 First, make sure to sign the petition right away and show your support for our efforts to pass Senate Bill 169, Constitutional Carry. Second, before the next floor session, we need to amass an army of supporters who can help further Constitutional Carry in Wisconsin. That’s why we are asking you to donate $100, $50, or even just $25 today to help with the mobilization effort. Third, make sure to forward this email to your family and friends. We need all the help we can get for this fight, and anyone you know that can join with us is greatly needed. As we prepare for the Christmas season, it’s time to ramp up our efforts to restore the 2nd Amendment in Wisconsin. As gun grabbers continue their assault on our right to keep and bear arms, it’s up to you to stop them. P.S. Permits to buy and carry handguns for self-defense are an infringement on the right to keep and bear arms. And in some cases, these permits have cost the lives of innocent victims like Carole Brown. She was murdered by her ex, while waiting for a permit to buy a handgun. It’s time for Wisconsin to remove the burdensome permit process for our citizens to carry their firearms for self-defense. You can help us do that by signing the petition for Constitutional Carry today. Then, in order for us to mobilize more gun owners, please consider a donation of $100, $50, or even $25 today! Merry Christmas from the Wisconsin Firearms Coalition!